Born in Melilla (Spanish Morocco) in 1932, shortly before the Spanish Civil War tore his country apart. His father an artist and officer of the Spanish Army was sentenced to death for opposing the military coup, he was transferred to various prisons but escaped in 1942, disappearing forever. The trauma created by this tragedy marks Arrabal’s life work. He began to mine his artistic talents, writing short stories based on his own young life. Excelling at school, winning numerous scholarships and ultimately studying in Paris and New York. In 1954 He also studied law in Madrid, where he met Luce Moreau, who became his wife. In 1955 he was awarded a 3-month scholarship to study in Paris, during this time he suffered a serious relapse of tuberculosis. In his words a “lucky mishap” which allowed him to permanently move to Paris. In 1962, his first collaborative panic inspired painting was chosen for reproduction in the noted art publication, “La Bréche: Action Surréaliste Revue” by its founding editor André Breton. In 1967, returned to Spain where he signed a dedication on one of his books critcal of the Franco government and was thrown into prison. International reaction from allies Samuel Beckett, Eugene Ionesco and Arthur Miller ensured a swift release. In 1968 he travels in Mexico with Jim Morrison. During 1970, translated his novel, Viva la Muerte (written in 1959), to the big screen. Considered one of the greatest works of the Spanish surrealist movement. The film won worldwide acclaim and the scorn of various censors. In 1971 John Lennon visits him enthusing about his film. Picasso paints a ‘Viva la Vida’ for him and asks Buñuel to deliver this gift. 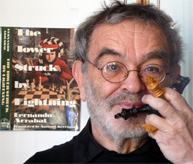 Arrabal has published 12 novels, 6 collections of poems, nearly 70 plays, 16 essays and epistles (among which the famous Letter to General Franco, published in the dictator’s lifetime), nearly 150 books for bibliophiles and poems illustrated by Dalí, Picasso, Saura, Olivier O. Olivier, Dorny, Corot, Pouperon and Fassianos. He has directed 7 highly acclaimed full-length films, working with the likes of Jorge Luis Borges, Mickey Rooney, & Spike Lee. Since 1990, Arrabal has held the honorary title of "Transcendent Satrape" in the College of ’Pataphysics (Collège de ’Pataphysique). Forty other Transcendent Satraps have been elected over the past half-century, including Marcel Duchamp, Eugène Ionesco, Man Ray, Boris Vian, Dario Fo, Umberto Eco and Jean Baudrillard. Driven by his hatred of fascism Arrabal has worked with artists around the world includingSalvador Dali, Miro, Picasso, Laurence Olivier and Mishima. Also close friends Andy Warhol and Tristan Tzara. He has produced at least 50 canvases, a hundred drawings, sculptures and collages over the years, which have been exhibited in around the world. His approach to painting consists of close collaboration with artists who produce large-format oils based on detailed sketches which he provides. He is one of the most controversial writers of his time, recognised throught the world. “I prefer Arrabal to Fellini or Ingmar Bergman… he is to cinema what Rimbaud is to Poetry” Le Monde.